Mountain Province Diamonds Inc has announced a 74% increase in the Inferred Diamond Resource at the Faraday 2 kimberlite at its Kennady North Project in Canada reflecting updated estimates following the discovery of the northwest extension of the pipe in 2017, which extended the kimberlite by 150 metres. The company said that the Updated Mineral Resource Estimate for the Faraday 2 kimberlite includes 5.45 million carats of diamonds contained in 2.07 million tonnes of kimberlite, with an overall grade of 2.63 carats per tonne. In comparison to the 2017 estimate, this represents a 49% increase in total tonnes, a 74% increase in total carats and a 17% increase in the overall grade. Further, the attributed average value per carat has increased to US$ 140 per carat; a 25% increase from the 2017 average values of US$ 112 per carat, Mountain Province said. The Faraday 2, Faraday 1-3, and Kelvin kimberlites, which are part of the Kennady Diamonds project, are now under Mountain Province following the successful completion of a business combination under which it acquired all of the common shares of Kennady. These kimberlites are located approximately 10 kilometers northeast of the Gahcho Kué Mine, in which Mountain Province is a JV partner with De Beers Canada. 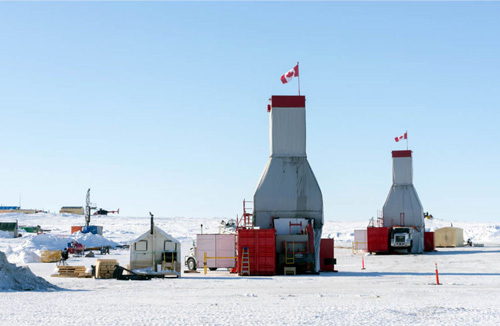 President and Chief Executive Officer for Mountain Province Stuart Brown commented: "The Faraday 2 project is one of three known kimberlites within our wholly owned exploration properties adjacent to the Gahcho Kué Mine. As anticipated from our microdiamond results reported earlier this year, the inclusion of the northwest extension at Faraday 2 has greatly increased the value of this resource and at an average diamond value of US$ 140 per carat offers significant potential. We are very pleased with the results of this exploration program and view this as a positive step towards potentially extending our operations beyond the existing mine plan at Gahcho Kué."